Russia has warned it will retaliate if Georgia uses force against its breakaway regions. Moscow has accused Georgia of preparing to invade Abkhazia, and says it is boosting Russian forces there and in the South Ossetia region. 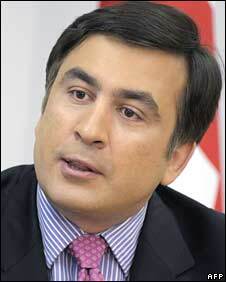 Georgia has reacted angrily to the Russian move, which its prime minister called "irresponsible". The EU also urged caution, saying to increase troop numbers would be unwise given current tensions. Russia's foreign minister said his country was not preparing for war but would "retaliate" against any attack. Russia says Georgia is massing 1,500 soldiers and police in the upper Kodori Gorge, the only part of Abkhazia which remains under government control. A statement from the Russian foreign ministry said that "a bridgehead is being prepared for the start of military operations against Abkhazia". 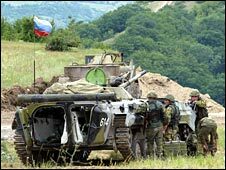 In response, it said, it was increasing Russian peacekeepers in both Abkhazia and Georgia's other breakaway region of South Ossetia. Georgia denies any build-up of its own forces in the area, and says that Russia is taking provocative action. "We think that this step, if they take it, will cause extreme destabilisation in the region," said Georgian Prime Minister Lado Gurgenidze. "From now on, we consider every [Russian] soldier or any unit of military equipment coming in [to Abkhazia and South Ossetia] as illegal, potential aggressors and potential generators of destabilisation." After meeting with Russian Foreign Minister Sergey Lavrov, EU foreign policy chief Javier Solana called on Russia to show restraint. "Even if the increase in peacekeepers is within limits, if we want to diminish the perception of tensions, I don't think it is a wise measure to increase now," Mr Solana said. Mr Lavrov said that Russia had to protect Russian-passport holders in the regions and that if Georgia took military action, Russia would have to take "retaliatory measures". Mr Solana's comments reflect a growing concern that Nato's promise to admit Georgia as a member one day, despite strong Russian opposition, could have unpredictable consequences, says the BBC's European affairs correspondent Oana Lungescu. Russia has kept a peacekeeping force in Abkhazia and South Ossetia under an agreement made following the wars of the 1990s, when the regions broke away from Tbilisi and formed links with Moscow. There are around 2,000 Russians posted in Abkhazia, and about 1,000 in South Ossetia. Last week Georgia accused a Russian plane of shooting down an unmanned Georgian spy plane - which Russian authorities insisted was shot down by Abkhaz rebels. And on Tuesday Georgia said it was blocking Russia's entry to the World Trade Organization. Many in Abkhazia believe that Kosovo's announcement of independence from Serbia in February provides a precedent for it to be recognised as an individual state. Although it has its own flag and postage stamps, it is not internationally recognised. Our correspondent in the area says that with this latest statement the Russian government has pushed the already bellicose rhetoric between the two countries to a new level.